Any change in sensation when using the restroom (numbness or loss of feeling in that area) should be considered a medical emergency and patients should go to the emergency room immediately. Permanent nerve damage to the bowels can create lifelong problems. In the lumbar spine, herniated discs that measure more than 10 millimeters are considered surgical candidates. This doesn’t mean that the patient will automatically require surgery but it is more likely given the size of the herniation. In some cases, smaller herniations will become surgical candidates as well. The placement of the herniation along with the patient’s symptoms are also useful in determining if surgery is necessary or if a more conservative approach can be utilized. The cervical spine is more difficult to classify, as smaller herniations may still be surgical. Again the symptoms and function of the patient is important in determining the need for surgery. Every case is different and should be treated conservatively if possible, and if that is not successful a referral to a neurosurgeon would be in order. Disc herniations cannot be viewed on x-ray. 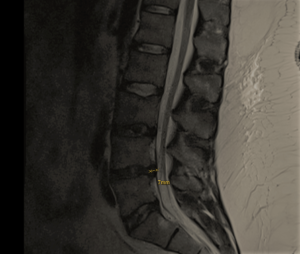 There are clues that can point to a herniation (like loss of disc height), but a definitive diagnosis requires an MRI. A MRI is helpful because it allows you to measure the size of the herniation which can be used to determine if surgery is necessary. Because disc issues can be so painful for the patient, combination therapy is often utilized. Pain management may be appropriate in conjunction with Chiropractic care. Some of the options are oral medications and injections. Patients are encouraged to continue with their recommended schedule of adjustments as this will increase the favorable results. If you have any questions or would like more information for yourself or a loved one, please feel free to reach out, we are here to help!